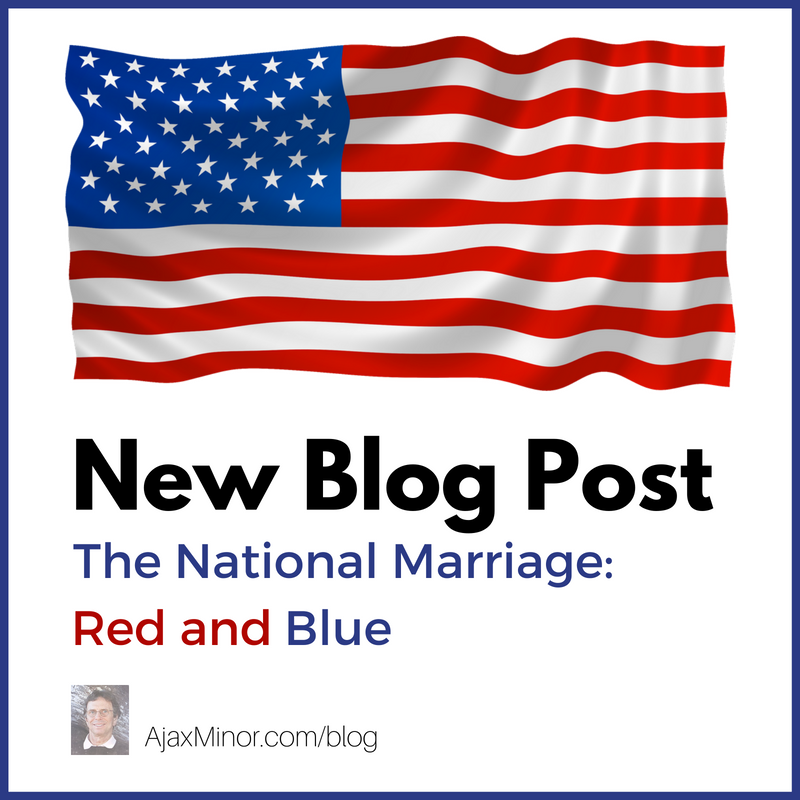 Last month, David Brooks wrote a column in the New York Times, to which he is a weekly contributor, entitled ‘How to Repair the National Marriage’. I’ve decided to write on that topic. In ‘The Girl from Ipanema‘ (which is Book #2 of The Ur Legend Book Series), the USA, as we know it, was fragmented into a number of regions: the new Confederate States of America, the Rocky Mountain Republic and several others. While the new configuration was geographical, there was more than geography that distinguished the boundaried polities. So I think Brooks’ idea is worth exploring, as the rupture in our national discourse is reflected in an aspect of the narrative in TGFI. And we continue our national food fight with a new point of contention each week. As I started writing this piece two weeks ago, the issue was Justice Kennedy’s replacement on SCOTUS. Now it’s ‘wouldn’t not would’. Dizzying to keep up with the weekly sources of venom. ‘How do I despise thee, let me count the ways’. If Brooks’ argument is to be considered, the first question becomes: Is the marriage worth saving? As the USA is the most powerful and, arguably, the most successful country in history, the answer must be ‘Yes’. However, the question then becomes: Can it be saved? Let’s examine Brooks’ analogy. Brooks writes about process. He makes the point that “the first task in repairing a marriage (and by analogy the National Marriage) is to seek empathetic understanding of the other person” and further that “The crucial step is the raw and willful decision each person must make…to recommit.” Are either of these expectations reasonable? It’s hard to believe this is possible, as discourse has deteriorated so badly. Not only is our national conversation ugly, but there are constant efforts on both sides of the political 50 yard line to undermine any attempt at compromise and to instigate outright hatred. So we’re off to a bad start. But assuming we might have a rational discourse, what can we hope to achieve? Brooks makes the inference, from the literature he’s read on the subject, that “the people who repair marriages don’t necessarily fix their central disagreement. They just overwhelm the negative with the positive.” In my mind, this is a form of self deception. Or to put it in more colloquial terms, we’re putting lipstick on a pig. That won’t fool anyone. For if there is an unresolvable central issue at the heart of the conflict, does it really make sense to move forward together? By objective measures, as I stated above, the ‘national marriage’ is worth saving; but does it make sense at a more visceral level. As an analogy, many marriages hold together ‘because of the kids’. Worthy, certainly, but after the ‘kids’ go off to college the internal tension becomes unbearable and the marriage dissolves. In the case of the US, the kids have grown up in the sense that we have proved a democratic polity to be achievable. The question then becomes: is our special demographic capable of living not only in harmony but of actually being happy as one national culture? To examine this let’s look at another of Brooks’ assertions, which I believe to be correct. He says: “Overcoming tribalism means rising up and taking care of problems that weren’t addressed at the founding…”. If one reads the Federalist Papers and the anti-Federalist arguments, it is clear that we had, and still have, a fundamental disagreement about the role of government. Hamilton represented those who believed in a strong central government and can be contrasted, not with Madison, but with Patrick Henry for whom ‘country’ meant his own state of Virginia. Robert E Lee used the same language referring to Virginia. It should be noted that while the Constitution was ratified unanimously, the vote was a very closely run thing, a 51/49 proposition, in many colonies. The issue remains still as a philosophical point of contention, which may never be resolvable. It is also worth noting a passage in Harper Lee’s ‘Go Set a Watchman’. Scout and her Uncle Jack have a long discussion arising out of Scout’s frustration with both her father, Atticus Finch, and with southern society in general after the Brown v Board of Education decision. Her uncle attempts to explain behavior in the white South of the time. He says: “Has it ever occurred to you…that this territory (south of the Mason Dixon line) was a separate nation?” He even invokes the phrase “Tribal feelin”! The demographics and philosophies of North and South were very different at the founding. So perhaps this is Brooks’ ‘central disagreement’, which can never be fully resolved. I believe, as he states, that we can overcome this by compromise and overwhelming “the negative with the positive” on a variety of issues. But what about the ‘Tribal feelin’? This is where the problem of satisfaction and happiness enter the debate. Hot button issues expose this unhappiness. In America before the Civil War, the issue was slavery that got murky and subjective, as opposed to disagreements about tariffs and government projects like canals that helped commerce grow and flourish. Today we deal with three issues that appear unresolvable: abortion, guns and gay rights. While Europe faces its own challenges, especially national identity and immigration, those may pass. It is even arguable that guns and gays can be resolved with rational policies. But abortion? Not only are the arguments strong and reasonable on both sides but the slippery notion of religion and God are brought into the discussion. And God is a tough one. Non believers can take comfort in the fact that believers can’t prove a god exists, and believers are safe in that it cannot be proven a god does not exist. Perhaps all of these contentious topics are merely symptoms of the original disagreement about the type of society in which a person wishes to live. And this is important because we all value ‘happiness’. Recall the ‘pursuit of Happiness’ as Jefferson’s odd substitution for ‘property’ in the Declaration of Independence. Maybe this is what he meant by the phrase. Maybe the value of a society cannot be measured by objective ‘success’ but by whether or not its citizens are in fact ‘Happy’. If I had been born in the late eighteenth century I would have been a Hamiltonian Federalist, in Lincoln’s time a Whig and I would have embraced Teddy Roosevelt’s Progressive domestic agenda. But I’m no longer convinced that the American experiment can continue to provide our citizenry with ‘happiness’. Perhaps Patrick Henry was right and we all need to live in our own ‘country’. The country that makes us content and fulfilled, even at the expense of economic gain and power. Think hard. This is an important question. Should we forsake this experiment and replace it with something different, call a Constitutional Convention, or should we do as David Brooks suggests and make the “raw and willful decision…to recommit”? The world I created in ‘The Girl from Ipanema’ was forced by an environmental catastrophe. We are not forced as a nation to make this choice but can make it of our own free will. So, what’s your choice?